Used to connect a variety of different devices including computers, scanners and printers, network cables can quickly become overwhelming in even small home offices, not to mention larger business situations. Corporate offices often use complex methods to label and manage network cables, and the entire process is usually overseen by a network specialist or manager. For those trying to label cables on their own, there are several tricks and tips that can help make the process a whole lot smoother. Depending on the number of labels needed for the networking job, a device like a cable labeler or label printer may be used to design and produce professional labels. While masking tape and a felt tip marker may be the quickest and easiest way to get the job done, anyone who needs the labels to last for more than a few months may want to invest in a professional cable labeler. These hand held devices print thermal labels that are designed specifically to heat shrink around cables, meaning they have years of life in them and the numbers or names on the label cannot simply wipe off. There are a wide variety of cable labelers on the market, including the Brady IDXpert and the Seiko Smart Label. A hand held cable labeler is probably the fastest and most secure way to label a large number of network cables in a way that will last for years to come. Another way to get labels for network cables is to print them out on a computer using adhesive paper or print them directly from a labeling device like a Brother P Touch. Adhesive labels have the advantage of being fast and cheap to use, and they only require a minimal monetary investment. There are also labeling software programs available that allow users to design customized labels on screen before beginning the printing process. They also offer many different sizing and formatting options for the labels themselves. The main disadvantage to pre-printed labels is that the adhesive quality is considerably less than the thermal labeling systems that basically shrink-to-fit the label directly onto the cable. Those who have the time often add a second layer over an adhesive layer, even if it is just a band of clear tape, in order to secure the label and protect the surface from damage and label obfuscation. Once again, the number of cables, equipment used and the size of the job will determine what kind of organization scheme is going to be best. Sequential labeling involves simply labeling each network cable with a number that is then recorded on a master sheet where it is linked to its appropriate name and function. Some label printing devices and software programs will automatically sequentially label each printed label, and even contract the database the keeps track of it all, making the job even easier. The user needs to only enter the first number in the labeling series for each job and the program will automatically print a new and consecutive number on each label. For those doing the labeling by hand or with a more primitive label printing device, sequential labeling is also a way to double check and keep track of cable count. For larger and more professional jobs, there is also the option of using specific software programs like TagPrint Pro to design custom labels. These custom labels can include images, icons or any other design that is desired for the tag. These designs can then be organized in a way that matches the order and purpose of the cables. 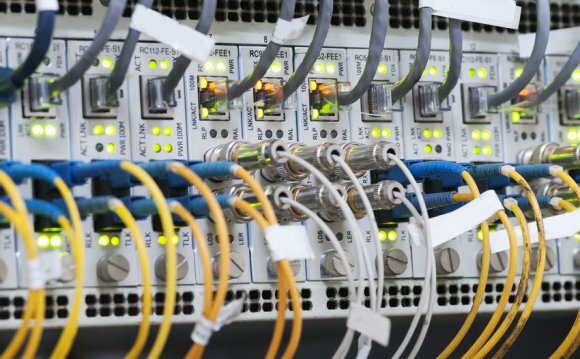 This method works best when there are large number of different types of cables involved, like Ethernet cables, power lines and fiber optic cables, so that a graphic system can really help to tell them apart (as opposed to a numbering system, where cables are counted but not separated by type). eBay is a bargain hunter's best bet when it comes to finding network cables and labeling equipment. Simply type the product name or category into the search bar on the home page to receive a complete listing of all available items from different vendors. Further refine these results by using the categories and filters listed on the left-hand side of the page.